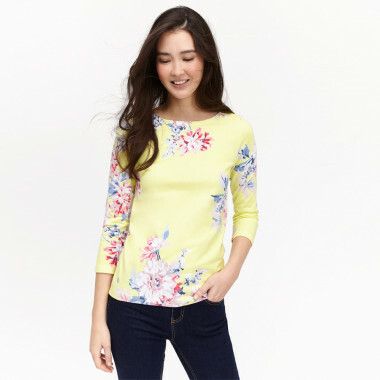 Bring some sun in your wardrobe with this Tom Joule light yellow jersey top enhanced by printed coloured flowers. It will bring a colourful and spring touch to your outfit. Sun is coming to yourwardrobe with this Tom Joule light yellow jersey top, enhanced by printed coloured flowers that will bring a colourful and spring touch to your outfit. This top feature subtle details: the discreet Tom Joule signature on the top back, an embroidery to the bottom, a woven patch on the left sleeve and a coloured band inside the collar.